The race isn’t over for four of our beloved seniors who have all signed letters of intent to run for four different Division 1 universities starting this fall. Anna Maxwell, Abby Sherman, Claire MacMillan, and Jessica Germany all ran cross country this year and did phenomenal, which gave them the opportunity to find great schools to attend and run for during their college career. Recognized all over the world, Anna Maxwell was the top runner in Division IV. She had a tough time last year, collapsing at the end of races yet still practically crawling to the finish line. After learning from last year, has adjusted to the circumstances in order to run better. She ran phenomenally and took first in almost every race she was apart of. Her speed has allowed her to travel to such places as Scotland, the Ukraine, and San Diego for National races. This year, she represented the U.S. on the United States junior team. She took 11th in the race and 3rd on her team in the Bupa Great XC International Challenge Run in Edinburgh, Scotland. Along with being a great runner, she is also a scholar, with a 4.2 GPA. 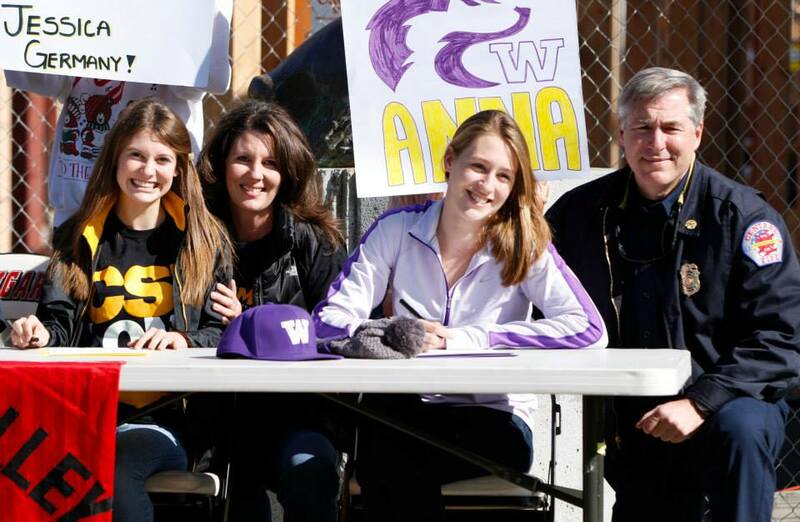 After all of this, she chose the University of Washington, a Division 1 school, to run and study the sciences. Abby Sherman, who had to sacrifice full seasons for surgery on her tibia, bounced back her senior year. She had a great season running for the Varsity Cross Country and is running track this year as well. She helped the team reach their goals in league, CCS, and the State Championships. After her last season of high school running, she plans on attending the University of Portland, a Division 1 university, to major in Marketing with a minor in Business, and of course, to run for the Pilots. Claire MacMillan was a captain of the Varsity Cross Country team, and was a leader the whole season with a great attitude. She ran well, always finishing as one of the first. She signed her letter of intent to attend the University of Utah at Salt Lake City, where she plans on studying Political Science and running for the Division 1 University. Last but not least is Jessica Germany, who plans on going to a California State University, Long Beach, where she will study Criminal Justice, and of course run for this Division 1 school. She battled through surgery on her knees, but made a great comeback. She is graduating early after taking classes over the summers, and will be college bound after only three years of high school. All letters of intent were signed Wednesday, February 5th during a lunchtime celebration for the excited and hopeful runners.